Membership - Upper Delaware Council, Inc. Gathered at the Upper Delaware Council’s Feb. 7, 2019 meeting were, seated: Secretary-Treasurer Alan Henry (Berlin), and Chairperson Harold G. Roeder (Delaware). Standing from left to right were: Mike Barth (Westfall), Dr. Ken Najjar (Delaware River Basin Commission), Doug Case (Lackawaxen), Kristina Heister (National Park Service), Nadia Rajsz (Lumberland), Roger Saumure (Shohola), Susan Sullivan (Tusten), Fred Peckham (Hancock), Tim Dugan (Commonwealth of Pennsylvania), Larry H. Richardson (Cochecton), Virginia Dudko (Deerpark), Aaron Robinson (Shohola), David M. Dean (Deerpark), Jim Greier (Fremont), and Andy Boyar (Highland). Shohola Township Aaron Robinson Roger Saumure, 1st Alt. 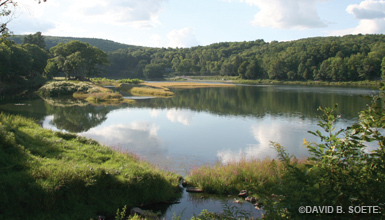 The deepest point on the Delaware River is located at Narrowsburg in the Town of Tusten, where the Big Eddy runs 113 feet deep. Normal riffle areas are 2-8 feet in depth and pools range from 12-20 feet deep.